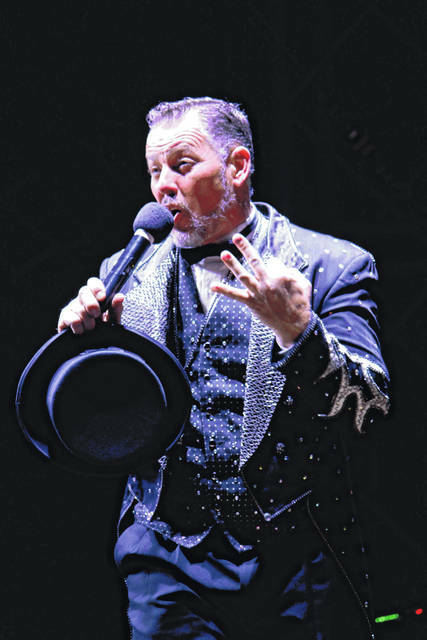 Anna Bolton | Greene County News Ringmaster Richard Curtis hosts the Antioch Shrine Circus opening night April 4 at the Greene County Fairgrounds. XENIA — For the Antioch Shrine Circus ringmaster, circus is family. It’s where Richard Curtis met his wife, Kimberly — a ninth-generation circus performer — 21 years ago. The two married shortly after Curtis joined the business. They’ve since passed their love of the circus onto their three children, who now perform alongside them. While Curtis is ringmaster and host of the show, Kim trains Rottweilers, and their kids team up for a motorcycle stunt inside a metal globe. The family has also done magic illusions together. “Family magic — where my kids come out and work with me and they’re part of the whole show. My daughter comes out and she does a back-bend up over me, brings me a little bunny and we do a bunny trick. It’s pretty cool,” Curtis said. The family travels 35 weeks out of the year, all around the U.S. and Canada, working for 26 of those weeks. But they’re not the only family with deep roots in the business. “The elephant trainer — he’s actually the grandson of the owner of the circus, Tarzan Zerbini,” Curtis continued. The ringmaster explained that the family that started the Tarzan Zerbini Circus, which is partnering with the Antioch Shriners, has 257 years of circus history. “It’s a huge family affair, generation after generation,” he said. So as Curtis hosts the show this weekend, his bedazzled tux shining under the lights and his booming voice echoing throughout the Big Top, the circus remains a family affair — for the boy who once ran away to the circus and for the boys and girls sitting in the bleachers, watching the ringmaster put on a show. The show continues 10 a.m., 2 p.m. and 6:30 p.m. Saturday, April 6 and 10 a.m., 2 p.m. and 6:30 p.m. Sunday, April 7 at the Greene County Fairgrounds, 120 Fairground Road. Tickets are $20 for General Admission (upper level, bleachers), $35 for VIP Seating (lower level, seats with backs) and $50 for Ringside Box Seats (first two rows, plush red velour seats). Children 3 and under sitting on an adult lap are admitted for free. Tickets can be purchased at www.antiochshrinecircus.com. https://www.xeniagazette.com/wp-content/uploads/sites/32/2019/04/web1_Ringmaster2.jpgAnna Bolton | Greene County News Ringmaster Richard Curtis hosts the Antioch Shrine Circus opening night April 4 at the Greene County Fairgrounds. 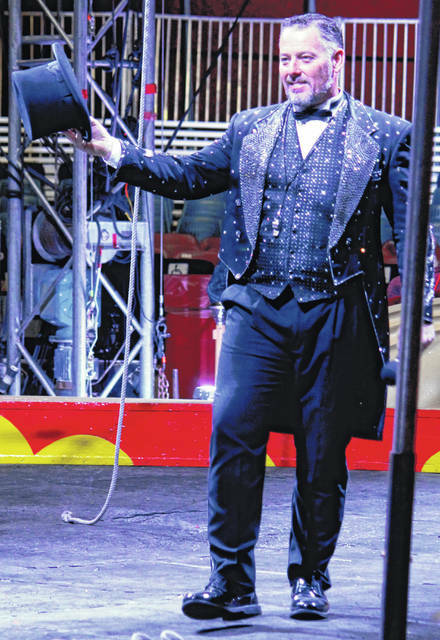 https://www.xeniagazette.com/wp-content/uploads/sites/32/2019/04/web1_Ringmaster4.jpgAnna Bolton | Greene County News Ringmaster Richard Curtis hosts the Antioch Shrine Circus opening night April 4 at the Greene County Fairgrounds.